Paul was appointed Director of Heart of Life in January, 2014. He has been involved in spiritual direction and pastoral formation since 1977, and participated in the first Siloam Program to be held in Melbourne, in 1980. Paul is an Emeritus Professor of the University of Divinity, and holds an MA in East Asian Studies from Yonsei University in Seoul, South Korea, a Masters in Divinity from Catholic Theological Union, Chicago, a Doctor of Ministry from Chicago Theological Seminary, and a PhD from the School of History, Philosophy, Religion & Classics at the University of Queensland. Paul has an academic and pastoral interest in the spiritual and mystic traditions of East Asian religions and the symbols immanent in these traditions. Peter is married with three adult daughters. After ministering for 11 years as an ordained Baptist minister in a couple of parishes, Peter was appointed Director of the WellSpring Spirituality Centre in 2003.His initial formation in spiritual direction was with the WellSpring Centre where he graduated in 1996. He has since completed post-graduate studies in Spiritual Direction including a Master of Arts Degree looking at the use of the Arts in a Creative Retreat context and a PhD thesis examining spiritual direction formation and its particular approach to learning. Peter currently coordinates a team that supports those in spiritual direction formation at the WellSpring Centre and he runs retreats and workshops with a particular interest in the Arts and the Enneagram. Carole Carmody is a supervisor at Heart of Life. She is Sister of Mercy with a passion for the contemplative approach to spiritual direction, prayer, formative processes and retreats. Simon Jenkinson is a Clinical Psychologist, who completed his studies in Spiritual Direction in 2017. Simon has specialised in Transcultural Psychology – working with migrants, refugees, and the survivors of war. In both New York and Sydney, he worked with people recovering from drug and alcohol addiction. More recently, in the role of Senior Counsellor, he was based at RMIT University Counselling Service, providing both individual counselling and group programs for students. Most recently, Simon has been exploring the interface between human psychosocial development, and spiritual development over the adult lifespan. Simon’s areas of special interest include: group process and facilitation; training of health professionals and academic staff in Mental Health First Aid; the application of Buddhist psychology to contemporary psychotherapy. Peter Malone msc was a member of the staff of YTU from 1972-1998. He taught Introduction to Old Testament, The Mystery of Christ, Introduction to Theology, Australian Theology, Media. He was editor of Compass Theology Review, 1972-1998. After serving as the president of the Catholic Film Offices of the Pacific (1989-1998), he was elected as President of OCIC (The International Catholic Organisation for Cinema) (1998-2001). When OCIC merged with UNDA (the International Catholic Organisation for Radio and Television) to form SIGNIS (The World Catholic Association for Communication), he was elected the first president (2001-2005). He has published articles and books on Theology, Spirituality and Cinema (and has reviewed films since 1968). Member of ACTA, Australian Catholic Theological Association. Michele McCourt, MA Spirituality, B Theol, Grad Dip Counselling, Certs Spir Dir & SupervisionMichele has spent many years in Education and Pastoral Care. She has been a Spiritual Director since participating in the Siloam Program in 2005. Michele appreciates the contemplative approach to Spiritual Direction that provides a reverent space for deep listening and discernment of God’s presence in our everyday life. Marlene has 10 years of involvement as a Pastoral Associate in a Melbourne parish. This brought her to a belief that the struggles and joys in the lives of people culminated in a ‘spiritual’ question. Thus began her connection with Heart of Life. She joined the Siloam program, became a spiritual director and currently works with the same process as a Supervisor. Marlene believes that faith and life intersect through myriad experiences in the mish-mash of life – the place where the Spirit continually invites, consoles, dwells, hides and challenges us to an active response from the heart. Robyn Reynolds OLSH has spent many years working and living with indigenous Australians in remote communities of the Northern Territory. After 10 years as lecturer and Dean of Catholic students at Darwin’s Nungalinya College, Robyn worked at Yarra Theological Union. She has also spent time in South Africa conducting workshops in Cross-Cultural Studies, Contextual Theology and Missionary Spirituality. She teaches in the area of Missiology, Spirituality, and Religious Education; of special interest is her unit “Social Teaching and Indigenous Peoples.” (Robyn’s doctoral thesis was entitled Catholic sacrament engaging with Wadeye Ritual). Kathleen is a Sister of the Good Samaritan and has a particular interest in Benedictine spirituality, spiritual direction and personal and faith formation. Her responsibilities include supervision and teaching in the Siloam formation program for spiritual directors at Heart of Life. 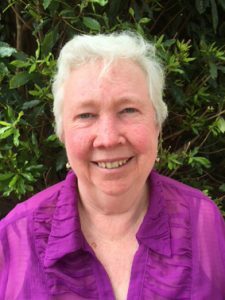 Kathleen has a background in Catholic education teaching in various Australian States and was engaged in teacher formation with the Catholic Education Office in Perth, Western Australia in the 1990’s. Kathleen’s professional and ministerial studies were undertaken at Boston College (M Ed), Murdoch University (Grad Dip. Theological Studies) and Heart of Life Spirituality Centre (Cert. Spiritual Direction and Supervision). Lis has been involved at Heart of Life since the last century!… and she loves her work. Every day brings a new opportunity for being surprised and delighted by the unique workings of grace in the heart of each person. The natural environment, together with the simple prayerful atmosphere within the buildings, work together to create a contemplative ambience, wherein everyone is welcomed and respected.